I love a well decorated front porch or patio space. They just welcome you. Even if you have a small front porch, deck, or balcony…well, welcome to the club. My front porch is literally 6 feet by 6 feet… but I’m determined to make it a welcoming space. And you can make your outdoor space wonderful too, with these front porch & patio decorating ideas and design tips… Not to mention the inspirational photos! Almost every one of these porch and patio makeovers have DIY tutorials to help you create your own special retreat. Use your outdoor space to enjoy…well, the outdoors! 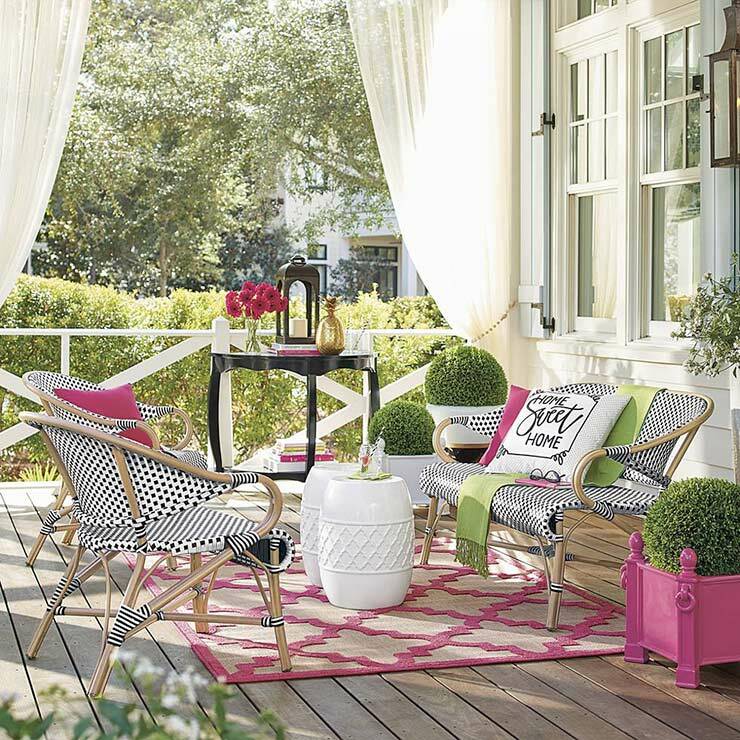 Let’s get started with these dreamy front porch ideas from ‘Inspired By Charm‘. 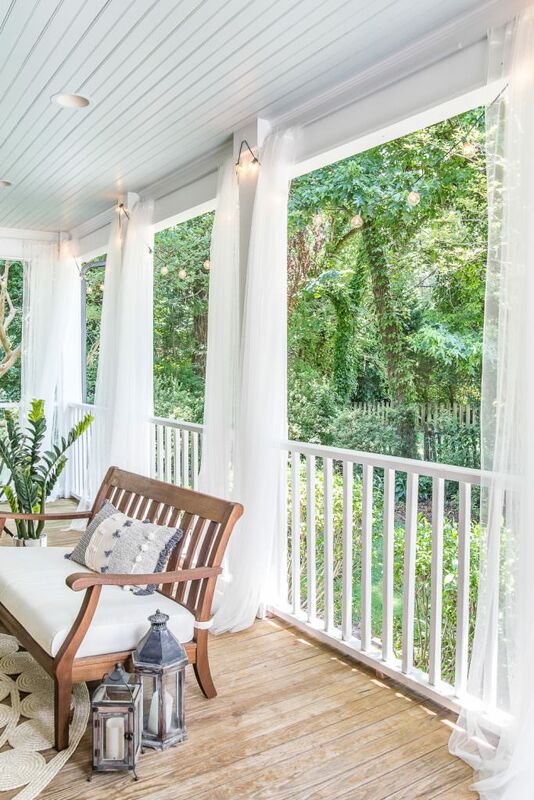 Doesn’t this porch just make you want to grab a cup of tea and a good book? Love the idea of the hanging baskets on either side of the porch to give it “walls”. 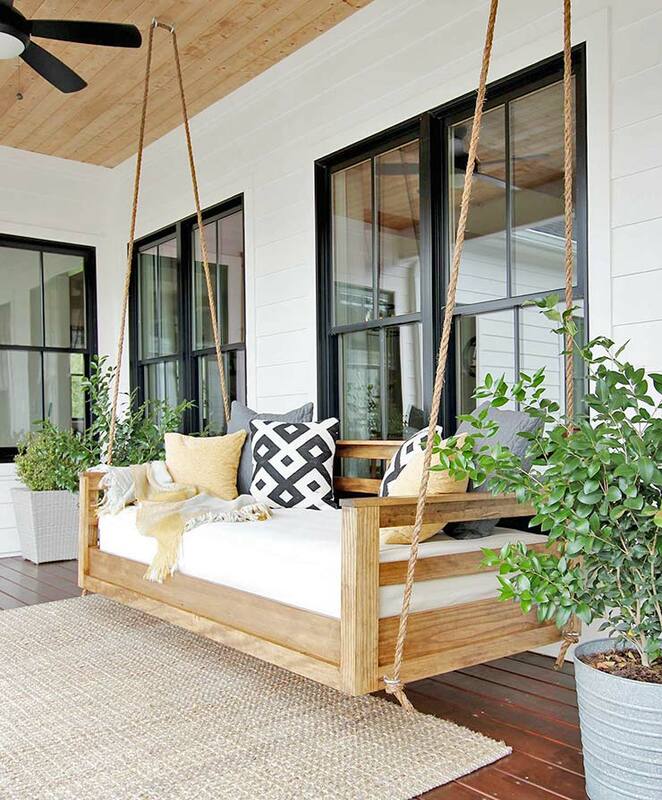 If you have a little more room on your front porch, make this hanging daybed with this tutorial from ‘Plank & Pillow‘. I can’t imagine ever wanting to actually go inside! 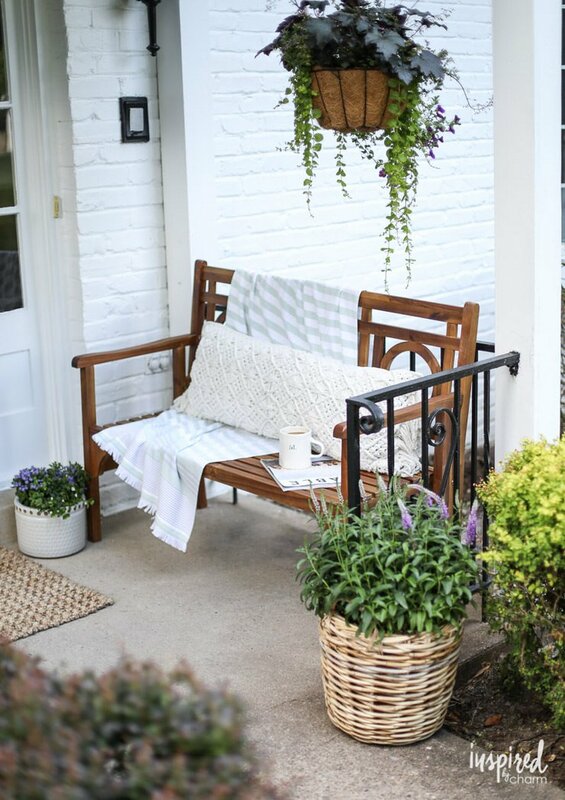 Check out this front porch makeover from ‘Paper & Stitch‘. She added some pretty cushions and an easy to clean throw rug for color, then a few planters that perfectly match her design. The nesting tables are perfect for a small outdoor space too. 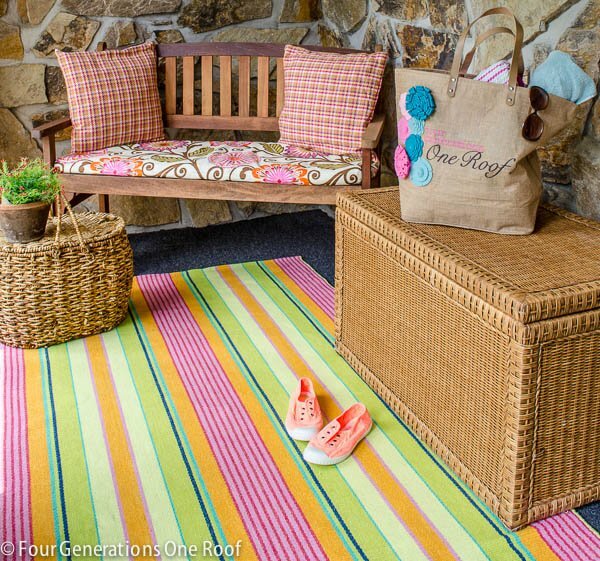 This colorful porch has tons of great ideas you can steal! We love color here at OhMeOhMy, and this one pops with interest and a little French bistro charm! You can find this furniture and these accessories at ‘Grandin Road‘. Check out this gorgeous front porch makeover from ‘Bless’er House‘, and get their tutorial for those amazing screening curtains! They open to give you privacy, or pull back to let you enjoy the view. Plus, they only cost $16 to make! So this pretty patio may be one of our favs. 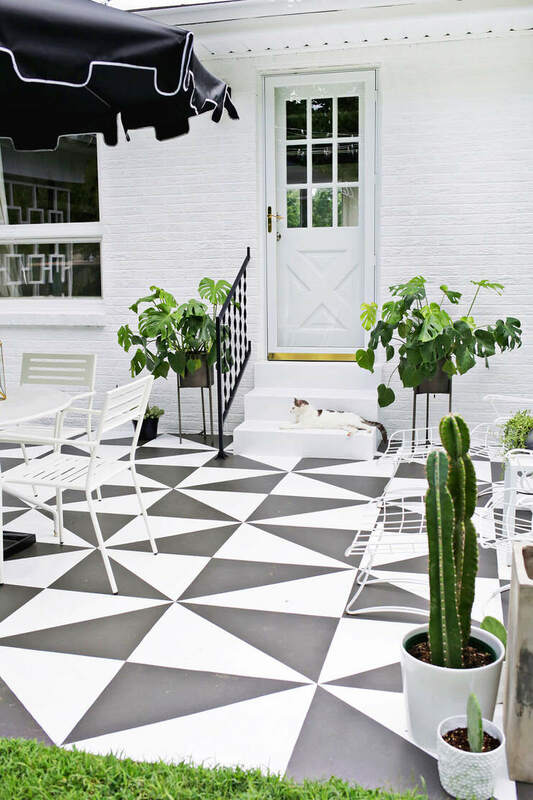 From ‘A Beautiful Mess‘, they have a complete tutorial for creating that cement tile look with just paint! The contrast really makes this patio pop, right? The rest of the space is full of great ideas too. 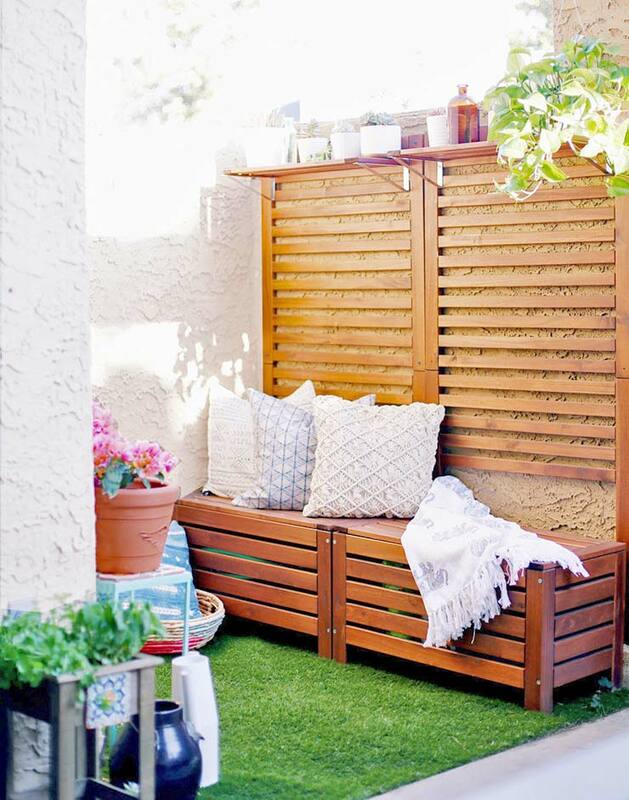 Love, love, love this natural look for this patio makeover from ‘The Fresh Exchange‘. They talk you through exactly how they got the look with lots of tips on how to recreate it yourself. There is nothing about this outdoor living space we don’t love! So, many of you know about our love of all things “Palm Springs”. 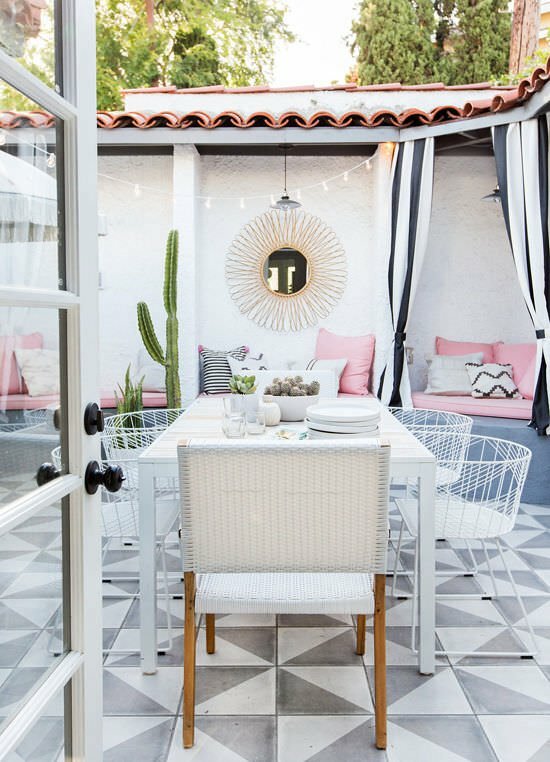 This patio makeover from ‘Design Love Fest‘ is the perfect example of that style! You cannot get more fun and fresh than this space. Tons of great ideas to steal, including the color scheme! ‘The College Housewife‘ took a tiny little courtyard patio and turned it into something really special with seating, a little green space, and even a place to grow some plants! 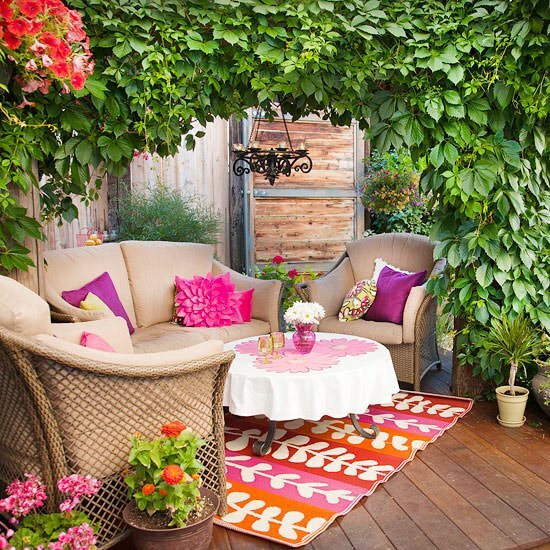 Just goes to show no matter how tiny your patio, you can make it wonderful! You’ve seen projects on our site before from ‘Four Generations, One Roof,’ because Jessica is so creative! 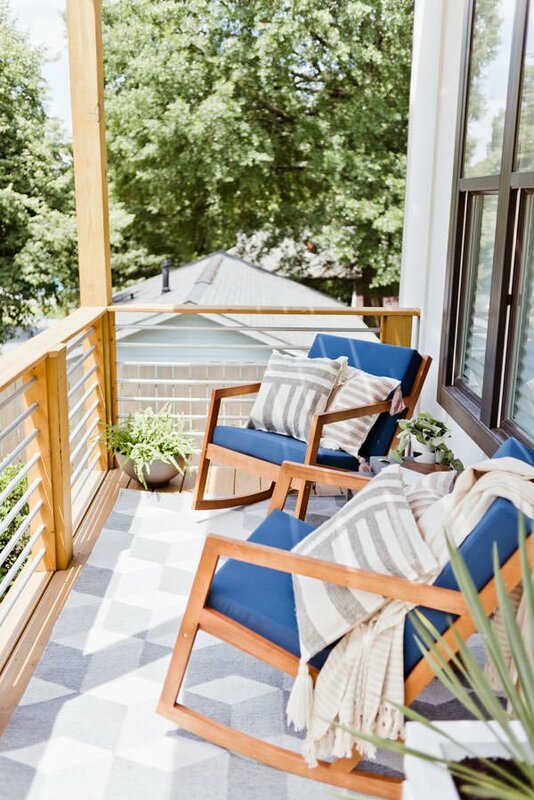 This DIY small porch was tackled like true DIY’ers… and you could easily find inspiration here in the colorful touches, the re-using of the chest as storage AND a table, and the simple idea of bringing the indoors out with the comfortable looking throw pillows and lantern for quiet evenings. Love it! Neutral furniture and pops of color, in a cozy corner carves out an intimate half circle, allowing space for more seating. 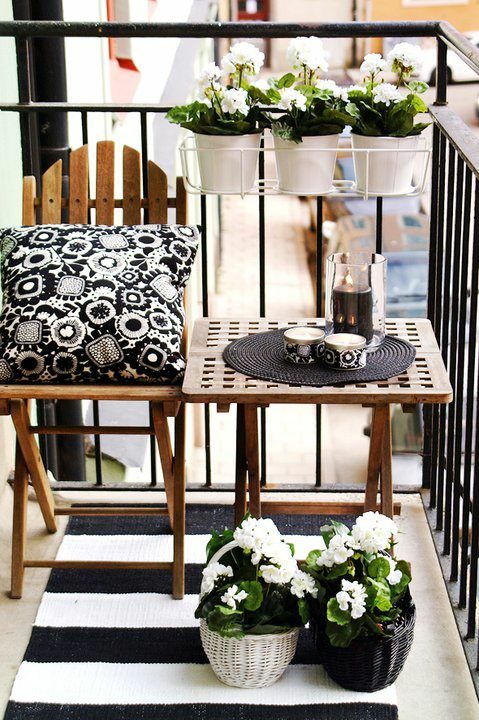 This small balcony is inspiring! No matter how tight the space, there is always a way. I’m going to use the layout of this balcony to tackle my front porch. And don’t you L.O.V.E. that black and white color scheme! Remember, small scale furniture, things that hang. Done. 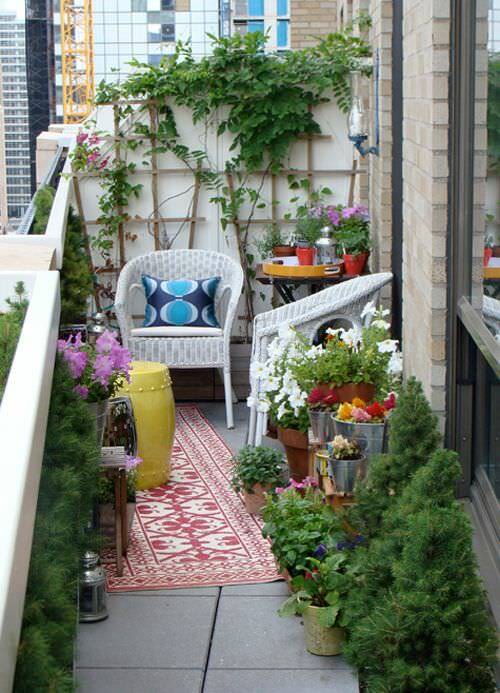 Another tiny balcony patio space that creates both seating and dining areas, and makes it pretty! Is that enough to get you started? 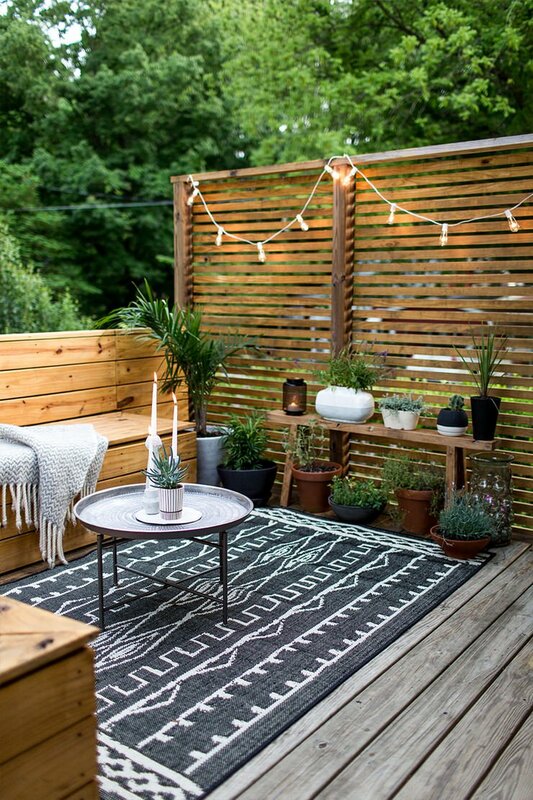 Well, we have one more for you to inspire… This small outdoor space utilizes the end of the porch for seating, then lines the long narrow sides with plants to keep things fresh. The runner rugs make it an outdoor home, and direct you right to where you want to go! So don’t let having a small porch or deck be your excuse… get to decorating! We hope you got tons of great ideas and projects to start in our post on Front Porch & Patio Ideas! We think you will also love our post on Stunning DIY Planter Box Ideas! 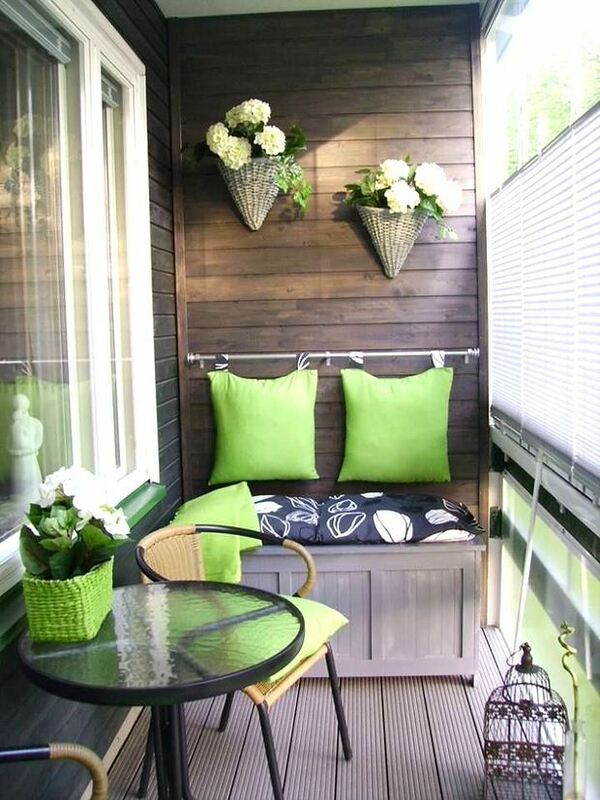 Thanks for sharing this wonderful small porch decorating ideas. perfect addition to my home improvement idea board… thanks! Thanks for sharing these! Perfect for my deck! The ideas were terrific, but before attaching anything to the walls of balcony/porch, check with apt rules regarding nailing or attaching items to the outside surfaces. This could be a big no-no and lose your security deposit if and when you decide to move. Where I live, NOTHING can be attached to outside wall, nothing in windows. We are not supposed to have any furniture or chairs outside; however, I have a small bistro table with 2 chairs and have not had to move them yet. I also have planters and pots so I have flowers all year round. The plans in front of my apt had died, so I asked if I could plant roses. Answer was yes and everyone here enjoyed them all last summer. im moving to an apt. Excellent ideas.. Must try. Well, now I have big plans for that little square of space out my back door. great! i love to try any of these. We only lived in two apts. during our 50 years of marriage..only one had a balcony and I would have never thought about decorating it but looking at this blog provides you with lots of inspiration. Love most of the ideas! Wow I love the ideas!